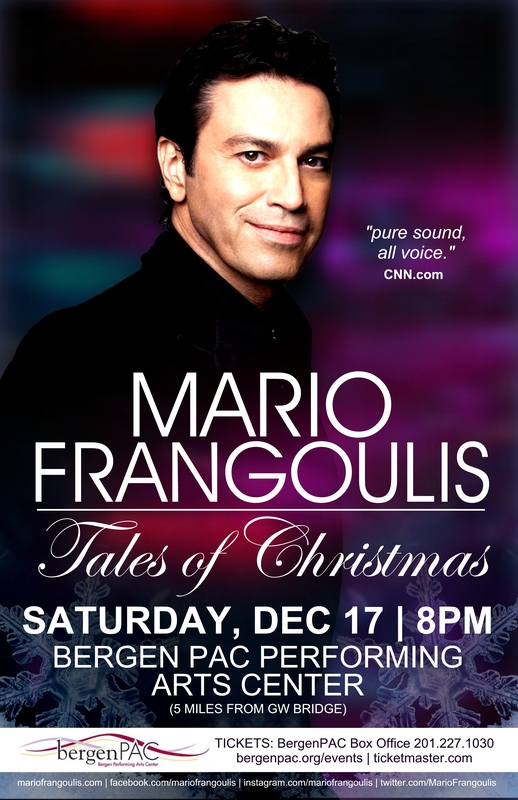 Acclaimed Classical Crossover Artist Mario Frangoulis Presents an Inspiring Holiday Concert Event Featuring Songs from His Newest Release "Tales of Christmas"
Join the “Best Male Classical Crossover Artist,” for a special concert event on Saturday, December 17, 2016. Inspired by the season, Mario has prepared a selection of songs from his newest release "Tales Of Christmas" for a concert program that will weave together holiday classics and unique contemporary interpretations in five languages, highlighting his spirited vocal presence and astonishing range. Mario Frangoulis, named “Best Male Classical Crossover Artist,” returns to the New York area for a special holiday concert event at the beloved BergenPAC on Saturday, December 17, 2016 at 8:00pm. He is back in the US after a series of concerts in Asia and Mexico with soprano Sarah Brightman. Described by Broadwayworld.com as "...the cross-over sensation blessed with movie-star good looks and one of the most beautiful tenor voices on earth..." and inspired by the season, Frangoulis has prepared a selection of songs from his newest release: Tales Of Christmas for a concert program that will weave together holiday classics and unique contemporary interpretations sung in five languages, highlighting his spirited vocal presence and astonishing range. Frangoulis will be joined on stage by the BergenPAC Chamber Chorus under the direction of Jeffrey Bryant featuring talented young singers between the ages of 7-17, who will not only join Mario, but also sing from their own holiday repertoire. "Tales of Christmas" is an inspiring collection of songs that tell a true tale of what the holiday season is all about: compassion, family, courage, joy, and the power of love. The album (which will be available at the concert event) and debuted at #14 on Billboard’s Classical Music Charts is a musical feast produced by six-time Grammy winner Jorge Calandrelli conducting the Philharmonia Orchestra of London, and recorded at the iconic Abbey Road Studios. Known the world-over for his refined vocal interpretations and instinctive ability to fuse the classical and contemporary, Mario will share vocal renditions of songs that range from classics such as “Jingle Bells” and “I’ll Be Home for Christmas” to “Ave Maria” and “Panis Angelicus” to Richard Marx’s “Christmas Mornings” and Charlie Chaplin’s masterpiece, “Smile” – representing Mario’s favorite "Tales of Christmas" to share with his audience. Frangoulis’ fans have long been aware of his diverse and far-reaching talent – from playing Marius in Les Misérables (cast by Sir Cameron Mackintosh) and Raoul in Phantom of the Opera (cast by Sir Andrew Lloyd Webber) to the role of Tony in West Side Story at Milan’s Teatro a la Scala. From winning the Maria Callas and Pavarotti competitions to performing with world-renowned orchestras including the Boston Pops, Chicago Symphony and Dallas Symphony, to name a few. He has also enjoyed a long-standing collaboration with public television, with 4 public television specials to his credit: Sometimes I Dream (2003), Music of the Night (2009), Mario Frangoulis Live With The Boston Pops (2013) and Sing Me An Angel (2016) which is airing during the 2016 holidays and throughout 2017. Frangoulis has released more than 15 personal albums, and been a fixture on Billboard’s Classical Crossover and Music charts. Fitting for the season, Mario is also acknowledged for his humanitarian work and focus on children, and in his role as Global Ambassador for the Horatio Alger Association of Distinguished Americans he is donating a portion of the proceeds from sales of the "Tales of Christmas" album to the Association for their educational scholarships. For tickets to "Tales of Christmas", Saturday, December 17, 2016 at 8:00pm at the Bergen Performing Arts Center, 30 North Van Brunt Street, Englewood, NJ 07631, just 5 miles from the GW bridge call the box office at: 201.227.1030 or purchase online at http://www.bergenpac.org, http://www.ticketmaster.com, or http://www.mariofrangoulis.com/concerts.